The Type 5611 mechanical seal is the first truly universal cartridge seal — and its modular family concept will change your approach to sealing. 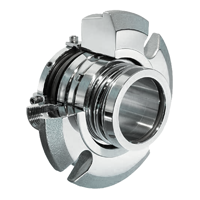 Type 5600 Series components are interchangeable, enabling one seal family to be applied throughout your plant. This gives you the flexibility to cover more applications with less inventory, thereby simplifying maintenance, reducing downtime, increasing plant operating efficiency and lowering costs.